After careful planning of our first half of 2013, Peter Brötzmann and Joe McPhee in Orlando on June 3rd entered the realm of possibility and we knew we should be involved. In order to keep our plans for 2013 intact, we decided that this concert would be less of a pro forma, ticketed concert and more of a fundraiser for our season. So here it goes; after twenty-six free creative music concerts presented at Timucua white house, here is your chance to become a philanthropist. Micro to macro, choose your level- from tickets to premiums or write a check for the cause. Claim your cm5 premiums at the concert. Let’s start here. This is a concert event and we have a commemorative ticket, no matter where you make your purchase. Buy an advanced ticket and secure your seating for $20 in-person at Park Avenue CDs in Orlando or from anywhere in the wired world here. 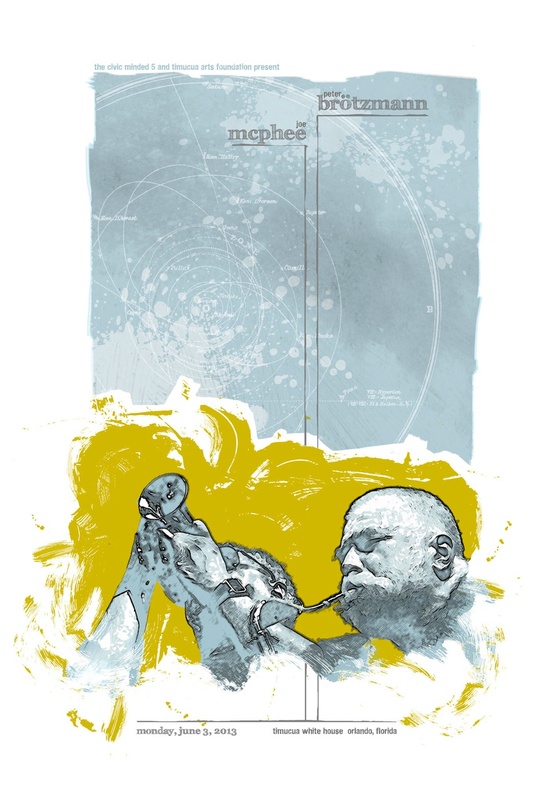 Help the cm5 extend our concert season by purchasing the Peter Brötzmann and Joe McPhee at Timucua white house concert poster in a super-finite screen printed form minted by the superbad Flying Horse Editions shop. The design is by the cm5’s Jim Ivy and is 18″ X 24″, printed on a fine art quality paper stock. The poster is conveniently fitted to a standard artwork size if you choose to treat this to matte and frame. $25 donation for each copy. Preorder here or see us at the show. 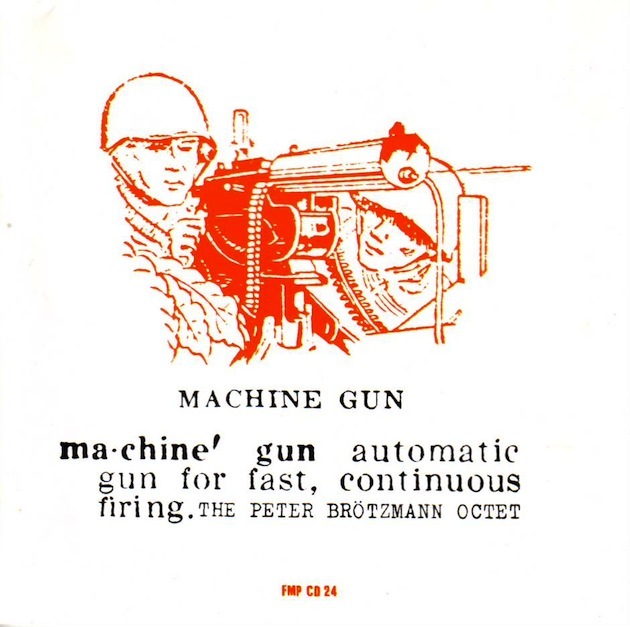 The Peter Brötzmann Octet Machine Gun album is, aural and visual, one of the iconic statements of 1960’s new jazz music. Celebrate Peter Brötzmann’s visit to the tourist destination with a suitably commemorative gift shop-style homage. 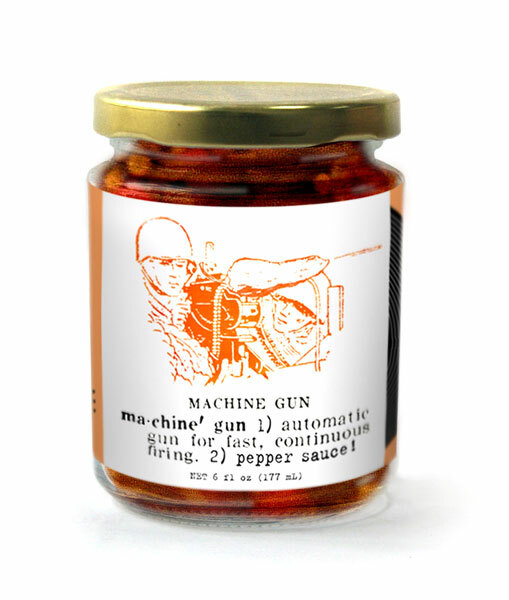 cm5’s Machine Gun Pepper Sauce isn’t some simple, macho-hot, endorphin drainer. The pepper sauce taste mirrors the layers of sonic sophistication that we present in concert, while the artwork triggers a Fair Use Parody clause. Probably to the chagrin of Wayne La Pierre and Jim Porter, we turn the .30 caliber water-cooled barrel into a capsicum-centric gastric projectile guide. A tasty, philanthropic, swords to plowshares memento awaits. $10 donation for each (now 8 oz.!) jar. Preorder here or see us at the show. Tags: Civic Minded 5, cm5, Joe McPhee, Machine Gun pepper sauce, Peter Brötzmann, Timucua Arts Foundation, Timucua white house. Bookmark the permalink. I’m going to post this on FB later today, edited a bit to shorten.